Ran into an old friend from back in the day at the Shoreline today. We quickly planned a surf for the afternoon. The reports were not in our favor but sometimes good things happen to those who just show up. Today was one of those days. Anyways, didn't do much catching up, just a lot of "catching". It was more of a surf rotation, one after the other. Yes, that sounds like we caught a lot of waves, and we did, but no wave hoggin' was going on. There was plenty of waves and nobody really out. Good times, good stuff! Too much fun. That's how I should always start a Stand Up Paddle Surf post. I remember when it happened. Back side smack of the top, I can still feel the board get loose. Not that I'm some kind of power surfer but I tend to break fins, always the same one, always on back side snap off the top. Almost every board I have I've had to had the fin system, fin box, fin re-glassed. Right hand trailing fin. Mikey I'll be calling you! Here's the view from today's stand up paddle session. The sun was out earlier, it was a beautiful morning sunrise. Wave action 2-3 feet with some fun lines to be had. Shared the south side with Dennis and another SUP'r who paddled over. The wind was finally blowing the right way, good times. I'd forecast today to be smaller than th past couple days, but size doesn't matter. However if the sun comes out expect crowds. Paddle with Aloha. The first day in a long time that the sun came out before noon. I was hustling to get some work done and get down there for some recharge. A buddy and I cruised down with the hope to surf but the intentions to just go check it out. After about 10 minutes we decided to paddle out just because it was a beautiful day. On the paddle out we were welcomed with a set that seemed like it wouldn't give up. I stood in the inside paddling waiting for an opening. Once out there the wave machine continued. Gotta love the south swell. What a surprise session. Slept in past sunrise, slow start out the door and had to run a quick errand before driving down to the beach chancing the winds/ tide combo yet still hopeful for a Stand Up Paddle session. The weather lately has been gray plus AM winds plus negative tides, if on Hawaii's 9th island (Vegas) I might as well write them a check with those odds. I pull up and act as if I'm going to watch it before I go out. As I catch myself thinking that thought I backup and drive down to my spot (yeah I have a spot). With the low tide and exposed reef I choose to leash my 12 foot Ron House SUP Board. The classic old faithful. The crowds light on the south peak but they must have been giving away gold on the point just to the north, stupid crowded! Paddled out and had some fun waves. Lefts, rights and about 20 minutes where the wind laid down and the faces cleaned up. The big set for my session started marching on the horizon so I took it on myself to be the welcome wagon. Especially since the one other guy hanging out with me was stuck on the inside. I greeted the 5 foot swell with an Aloha and cruised back to my spot. Walked out in the sand, showered and started the work day. So know I watch the winds hoping for a repeat.... with less winds. Saturday AM. Swell is here but it's Saturday and I wanna go Stand Up some fun waves with a little juice on it. So I cruise to a spot that breaks off a rock reef that has some new sand in it. The tide is good, wind is good, crowd is overwhelming... and I'm the only Stand Up Paddle Surfer. 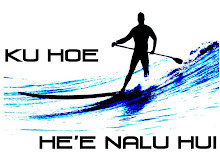 I paddle through the line up and get a couple hecklers, but they're bruddahs from the past so it's all good and in fun. However I get that vibe from others, they don't understand that I come packing Aloha. Watching the sections come and go I paddle over to a spot that no ones really at on a wave that is make-able only on a SUP. Right after right after right. I'm riding my 9'6" and having fun smacking it on the bing bong! The fin configuration is loose which makes for a lot of fun. Another wonderful day in the water. Sorry no pics, the skies are too gray.